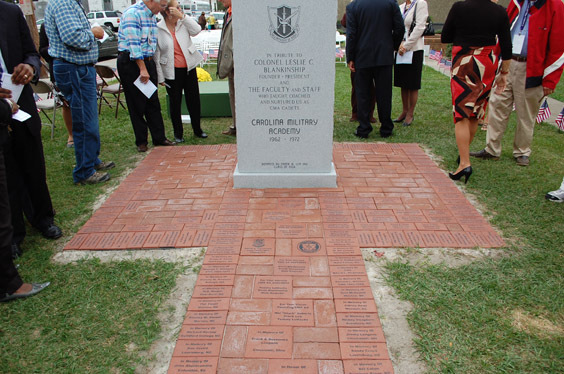 Welcome to the Carolina Military Academy Alumni Association, CMA Memorial Monument, and engraved brick paver project web page. Thanks to the foresight of a fellow cadet who was also later a faculty member, as well as the cooperation and coordination of your CMA Board of Directors, we have entered into a combined project that will again give our former CMA cadets, parents of lost cadets, former faculty members and friends a place in Maxton N.C. that can be revisited and remembered as a special place dedicated to our president and founder Col. Leslie C. Blankinship and the facuty and staff who taught, coached, and nurtured us as CMA cadets. The other side of the monument will honor those CMA cadets who lost their lives in Vietnam. It will feature their name, branch of service, and a picture of each taken from the CMA annuals. 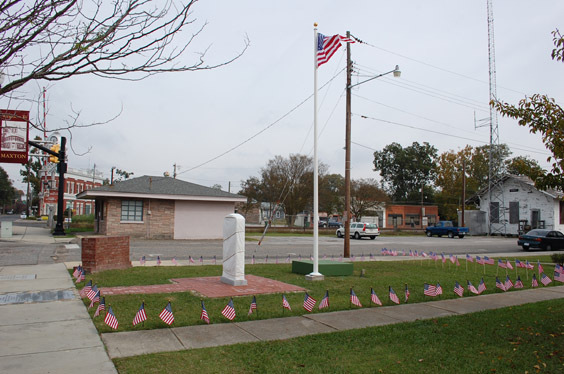 We intend to make use of the monument and brick paver surround as a memorial to be visited on special or solemn occasions. When one of our alumni is in the area and wants to visit and reflect on school memories or fallen friends there will now be somewhere in Maxton to go. The lessons and guidance that we learned as students at this school have helped to mold our lives. This memorial will serve as a place where we can come and give honor to those who by virtue of their teachings made all of our lives better. And it will insure that the legacy of CMA will live beyond our lifetimes. We ask that you look into your heart and help us build this lasting memorial with your donation in remembrance of these fine leaders of the past. CMA gave us a lot. Now is the time to give a little back. Below are photos of the actual CMA monuments as seen at the CMA Memorial Dedication event on Oct. 27 2012. The CMA Alumni Association intends to continue the CMA Brick Project and will sell bricks until we reach our limit. The surround now contains 189 engraved bricks. As promised the association has put all profit after expenses back into the surround and will continue to do so as long as the project is open. Thanks to the kind generosity of our cadets, faculty and staff as well as family members and your association, every deceased cadet, faculty and staff members names are now represented by an engraved brick in the surround. If we have forgotten any names of deceased CMA alumni members please notify us and that will be corrected. 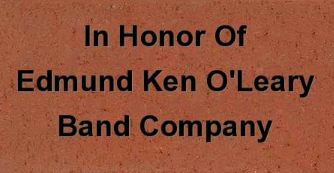 It is our intention to represent any future deceased member of the association in this brick surround at the CMA Memorial Monument. Samples of individual engraved bricks are shown below. There will only be one font, Arial, and we will use what is called title case (the first letter of each word will be capitalized). You will be allowed a maximun of three lines with a maximun of 20 characters per line including spaces. The bricks above are samples and closely resemble the engraved bricks you are purchasing. These bricks are laser engraved and are guaranteed for life. The Association is offering you a very special price on your second or more brick paver purchases. Once you have purchased an engraved brick for yourself or any other cadet or faculty member at the original price, you may then buy any additional number of engraved bricks at 50% off as long as the first line includes the words "In Memory Of", "In Loving Memory Of" or any other similar devotional quotation for any deceased CMA loved one, sibling, parent, deceased CMA cadet or faculty member. You may also purchase a second or more bricks as monument for a living CMA faculty or school staff member (no student bricks allowed at this price). Once you have made your purchase and paid for your bricks you must go to the home page and click on the red "Engrave My Brick" button. This will take you to a form where you can put your lettering that you wish to have placed on the bricks you have purchased. Checks or credit cards will be accepted. There will be a 4.9% discount for check purchases. No checks purchases will be engraved until funds have reached our account. We hope to have this brick paver project completed as soon as possible. It is our intention to have an unveiling during our regional reunion in Maxton sometime in late October 2012. Please respond promptly the bricks will take a minimum 30 days to engrave. 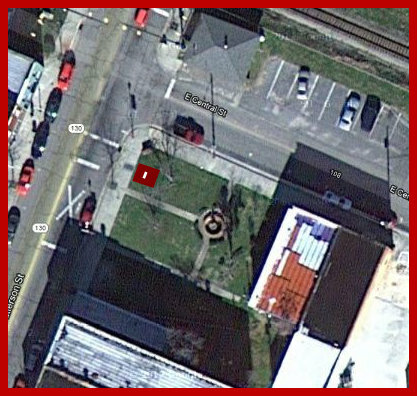 The CMA monument, brick surround, and brick pathway will be in the park at the corner of East Central Avenue and Patterson Street (which is the main street of Maxton, NC). If for any reason you feel uncomfortable or have any problem placing this online order, please contact Randy Jennings at 843-450-5800 and he will enter your information for you.